TRANSPORT Minister Danny Kennedy has welcomed plans to begin two resurfacing schemes costing nearly £300,000 in the Down District Council area this month. Roads which will benefit from the planned resurfacing works are the A24 Belfast Road Ballynahinch and Strangford View, Killyleagh. Improvement works welcomed for resurfacing schemes in Ballynahinch and Killyleagh. The roads investment has also been welcomed by Rowallene Councillor Billy Walker who said: “This is good news fro both Ballynahinch and Killyleagh. I was active in lobbying the DRD for improvements to the Strangford View road issue and I would like to thank Hugh Morgan of Roads Service and his team for all their help. 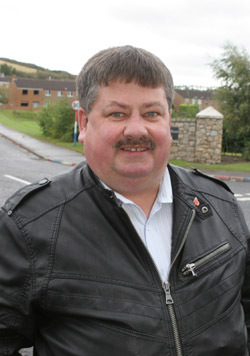 Councillor Billy Walker has welcomed the announcement of surfacing improvement to local roads. ‘’Although this part of Killyleagh has been resurfaced a few years ago, it had been badly affected by weather and the brick-type stones are lifting up making them unsafe. The Minister added: “As part of its programme of roads maintenance, Roads Service will resurface a 550 metre stretch of the Belfast Road, Ballynahinch. The scheme, which will cost £189,000, will improve the structural condition of the road. A contra-flow traffic management arrangement and a temporary 40 mph speed limit will be in place on the Belfast Road, Ballynahinch over the duration of the works. “Work is due to commence in Ballynahinch on Monday 15 October and will last for approximately one week. Work on the lifting of the existing brick pavior surface in Strangford View, Killyleagh, and resurfacing in asphalt is due to commence on Monday 5 November 2012 and last for six weeks“The carrying out of the works will require the closing off of parts of the road and parking areas while work is carried out. The above planned dates of both schemes are subject to favourable weather conditions and Roads Service will keep the public informed of any change.